Electromagnetism is the physics of the electromagnetic field: A field that exerts a force on particles that possess the property of electric charge, and it is in turn affected by the presence and motion of those particles. A changing magnetic field produces an electric field, a phenomenon known as "electromagnetic induction." This phenomenon forms the basis of operation for electrical generators, induction motors, and transformers). Similarly, a changing electric field generates a magnetic field. A magnetic field is produced by the motion of electric charges, that is, an electric current. The magnetic field produces the magnetic force associated with magnets. Because of this interdependence of the electric and magnetic fields, it is appropriate to consider them as a single coherent entity, the electromagnetic field. The theoretical implications of electromagnetism led to development of the theory of special relativity by Albert Einstein in 1905. While preparing for an evening lecture on April 21, 1820, Hans Christian Ørsted developed an experiment which provided evidence that surprised him. As he was setting up his materials, he noticed a compass needle deflected from magnetic north when the electric current from the battery he was using was switched on and off. This deflection convinced him that magnetic fields radiate from all sides of a wire carrying an electric current, just as light and heat do, and that it confirmed a direct relationship between electricity and magnetism. Ørsted was not the first person to examine the relation between electricity and magnetism. In 1802, Gian Domenico Romagnosi, an Italian legal scholar, deflected a magnetic needle by electrostatic charges. He interpreted his observations as The Relation between electricity and magnetism. Actually, no galvanic current existed in the setup and hence no electromagnetism was present. An account of the discovery was published in 1802 in an Italian newspaper, but it was largely overlooked by the contemporary scientific community. This unification, which was observed by Michael Faraday, extended by James Clerk Maxwell, and partially reformulated by Oliver Heaviside and Heinrich Hertz, is one of the accomplishments of nineteenth century mathematical physics. It had far-reaching consequences, one of which was the understanding of the nature of light. As it turns out, what is thought of as "light" is actually a propagating oscillatory disturbance in the electromagnetic field, that is, an electromagnetic wave. 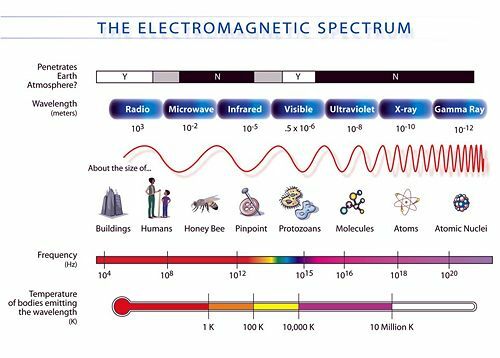 Different frequencies of oscillation give rise to the different forms of electromagnetic radiation, from radio waves at the lowest frequencies, to visible light at intermediate frequencies, to gamma rays at the highest frequencies. The force that the electromagnetic field exerts on electrically charged particles, called the electromagnetic force, is one of the fundamental forces, and is responsible for most of the forces we experience in our daily lives. The other fundamental forces are the strong nuclear force (which holds atomic nuclei together), the weak nuclear force and the gravitational force. All other forces are ultimately derived from these fundamental forces. The scientist William Gilbert proposed, in his De Magnete (1600), that electricity and magnetism, while both capable of causing attraction and repulsion of objects, were distinct effects. Mariners had noticed that lightning strikes had the ability to disturb a compass needle, but the link between lightning and electricity was not confirmed until Benjamin Franklin's proposed experiments in 1752. One of the first to discover and publish a link between human-made electric current and magnetism was Romagnosi, who in 1802 noticed that connecting a wire across a Voltaic pile deflected a nearby compass needle. However, the effect did not become widely known until 1820, when Ørsted performed a similar experiment. Ørsted's work influenced Ampère to produce a theory of electromagnetism that set the subject on a mathematical foundation. An accurate theory of electromagnetism, known as classical electromagnetism, was developed by various physicists over the course of the nineteenth century, culminating in the work of James Clerk Maxwell, who unified the preceding developments into a single theory and discovered the electromagnetic nature of light. In classical electromagnetism, the electromagnetic field obeys a set of equations known as Maxwell's equations, and the electromagnetic force is given by the Lorentz force law. One of the peculiarities of classical electromagnetism is that it is difficult to reconcile with classical mechanics, but it is compatible with special relativity. According to Maxwell's equations, the speed of light in a vacuum is a universal constant, dependent only on the electrical permittivity and magnetic permeability of free space. This violates Galilean invariance, a long-standing cornerstone of classical mechanics. One way to reconcile the two theories is to assume the existence of a luminiferous aether through which the light propagates. However, subsequent experimental efforts failed to detect the presence of the aether. After important contributions of Hendrik Lorentz and Henri Poincaré, in 1905, Albert Einstein solved the problem with the introduction of special relativity, which replaces classical kinematics with a new theory of kinematics that is compatible with classical electromagnetism. In the theory, electromagnetism is the basis for optical phenomena, as discovered by James Clerk Maxwell while he studied electromagnetic waves. Light, being an electromagnetic wave, has properties that can be explained through the Maxwell's equations, such as reflection, refraction, diffraction, and interference. Relativity is born on the electromagnetic fields, as shown by Albert Einstein when he tried to make the electromagnetic theory compatible with Planck's radiation formula. ↑ www.phy.syr.edu, The Light Cone: Maxwell and the Electrodynamic Theory of Light. Retrieved October 4, 2008. ↑ cat.inist.fr, On Einstein's distrust of the electromagnetic theory: The origin of the light-velocity postulate. Retrieved October 4, 2008. Dibner, Bern. 1961. Oersted and the Discovery of Electromagnetism. New York, NY: Blaisdell Publishing Company. Durney, Carl H., and Curtis C. Johnson. 1969. Introduction to Modern Electromagnetics. New York, NY: McGraw-Hill. ISBN 0070183880. Griffiths, David J. 1998. Introduction to Electrodynamics, 3rd ed. Englewood Cliffs, NJ: Prentice Hall. ISBN 013805326X. Jackson, John D. 1998. Classical Electrodynamics, 3rd ed. New York, NY: Wiley. ISBN 047130932X. Nave, R. Magnetic Field Strength H. Retrieved October 4, 2008. Oppelt, Arnulf. Magnetic field strength. Retrieved October 4, 2008. Rothwell, Edward J., and Michael J. Cloud. 2001. Electromagnetics. Boca Raton, FL: CRC Press. ISBN 084931397X. Tipler, Paul. 1998. Physics for Scientists and Engineers: Vol. 2: Light, Electricity and Magnetism, 4th ed. New York, NY: W.H. Freeman. ISBN 1572594926. Unit Conversion. Magnetic field strength converter. Retrieved October 4, 2008. Wangsness, Roald K., and Michael J. Cloud. 1986. Electromagnetic Fields, 2nd ed. New York, NY: Wiley. ISBN 0471811866. All links September 15, 2017. Circuit Construction Kit PhET at University of Colorado, Boulder. Electromagnetic Tutorials and Forums EM Talk. Classical Electromagnetism: An intermediate level course - an online intermediate level textbook downloadable as PDF file. Sophocles J. Orfanidis' Electromagnetic Waves and Antennas. Classical Electrodynamics and Theory of Relativity - by Ruslan Sharipov. This page was last modified on 15 September 2017, at 19:33.